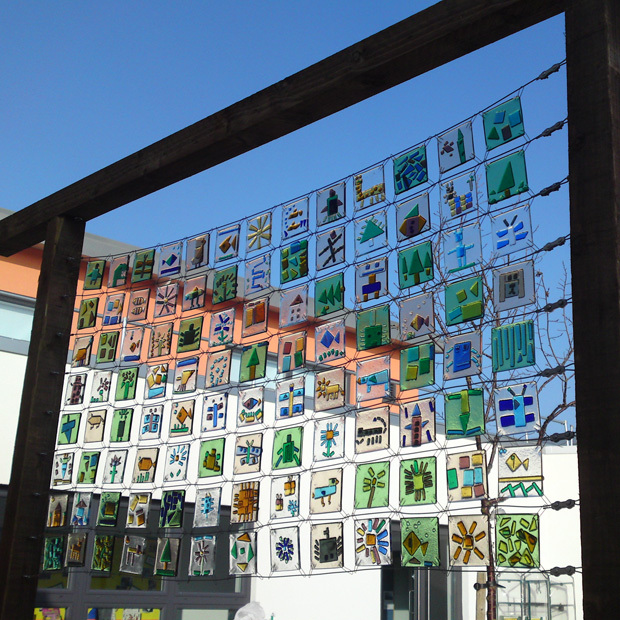 We were invited by the school to create a permanent glass feature involving the whole school that would not cause any alterations to the fabric of the building. 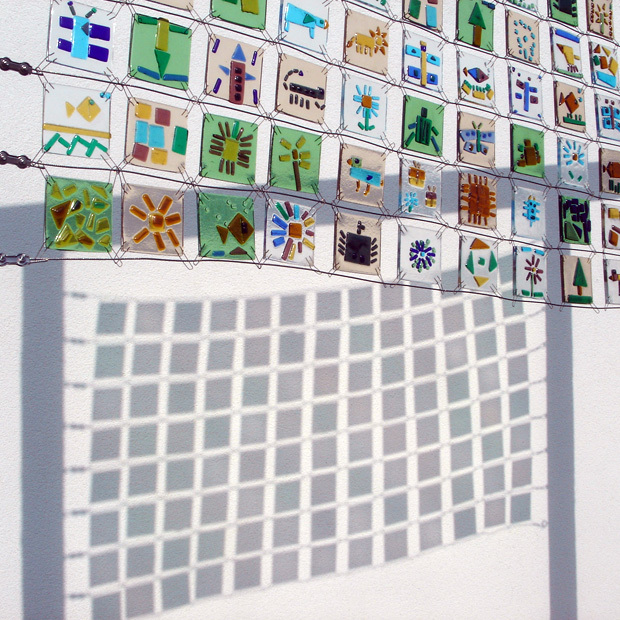 A decision was made that the best place for the artwork would be in the courtyard area, which is positioned at the heart of the school and can be viewed internally from all aspects. 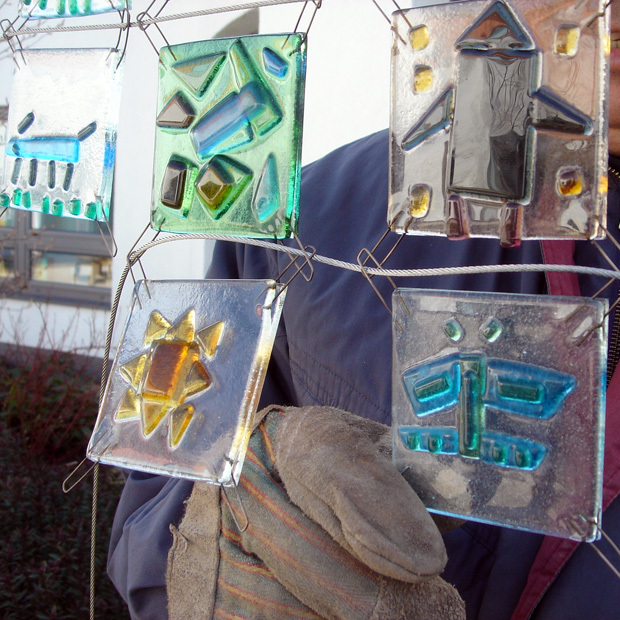 Every pupil at the school was provided with the opportunity to take part in glass workshops delivered on a class-by-class basis. Within each workshop individuals were asked to create a design for a 3” glass tile based on the theme of the natural environment. The challenge presented was that the design could only be made from shapes with straight edges. This encouraged collaborative problem solving and highly increased motivation towards the activity. We then worked with pupils on a one-to-one basis in order to realise their designs. During this process pupils gained an insight into the work of an art and design professional by watching their shapes being safely cut. Pupils then glued their shapes down to their tile ready for fusing in a glass kiln. We created a system for the tiles so that they could be suspended from stainless steel wire rope attached to a fixed wooden frame. In total there were 208 tiles making up two glass features facing each other within the courtyard. The pupils really enjoyed working on the project as not only did they design a final product it also provided them with the hands on experience of working with a sustainable material – glass. The installation further developed their insight into the roles of a professional, as they were able to see the stages of completion that a feature such as this requires. These tiles went on to make a stunning structure within the tranquil settings of the courtyard area that varies in appearance throughout the day and year dependent upon the light and weather.